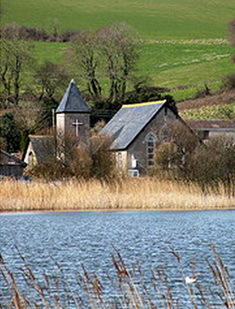 Torcross Chapel is by Slapton Ley on the south coast of Devon, the largest natural freshwater lake in south west England, situated within the South Devon Area of Outstanding Natural Beauty. This National Nature Reserve is a Site of Special Scientific Interest and is managed by the Field Studies Council due to the habitat and the rare species which thrive in the unique conditions. Woodland, Reedbeds and Fen surround the lake which actually consists of two leys, a lower ley and a higher ley. The higher ley to the north consists of rich fen vegetation and wet willow woodland (called Carr) with the larger open-water lower ley to the south with its underwater plant life and reed fringes. Famous for its diversity of bird life and is an important staging post for wintering and passage birds including swallows, Cetti’s Warbler can be heard here all year round and Bittern are resident. The diverse habitat at Slapton Ley National Nature Reserve includes more than 10 hectares of south and south-west facing grassland, ideal for many butterfly species, and was bought by the Whitley Wildlife Conservation Trust in 2004. At that time, it was identified as a potential site for the reintroduction of the Large Blue butterfly. Slapton Ley’s 200 acres provides a home for fish, dormice, badgers, otters, bats, insects and rare flora. Look for wildflowers on the shingle ridge during the summer including Yellow Horned-poppy and Viper’s Bugloss. The lake shore is the only place in Britain where Strapwort can be found. Among the many rarities found here, are 250 species of lichen and 2000 species of fungi, 29 of which have been described as new to science. Around 650 Cetti’s Warblers (pro. Chetty’s) are thought to be resident in the UK, nesting mostly along the south coast of England in reedbed, swamp, and dense vegetation near water. Strapwort [Corrigiola litoralis] is a critically endangered plant growing on the shore of Slapton’s Lower Ley, the only place in Britain it is found. The Large Blue butterfly [Maculinea arion] is a member of a group of blue butterflies, all of which are in decline. It became extinct in the UK in 1979, largely due to changes in the way grassland was managed. The Large Blue butterfly has since been reintroduced successfully at over 30 sites as part of an important habitat and species conservation programme involving many partner organisations. The key to successful reintroduction lies in understanding the butterflies’ complex life cycle. The butterflies lay their eggs on the flowers of wild thyme which provide the initial food source for the caterpillars. Initially, the caterpillars feed on the flowers, but at a certain point in their development, they drop off the plants, are picked up by a particular species of ant and taken to the ants’ nest. There, the caterpillars feed on the ant larvae until they pupate and emerge as an adult butterfly in late June. One of its previous strongholds was along the south Devon coastline, which is now a target area for potential re-introductions. In the closing months of 1943, the Americans were arriving in the South Hams of Devon, England, to begin military rehearsals ahead of the Normandy Invasion in June ’44. It was a huge operation by any standards, but along the rural coastline of Slapton Sands, it brought a major clash of sensitivities with the people and the land. The Fields of Thyme is a book about a young and socially unsuccessful farm boy, Tom Skinner, to whom only one thing really matters; the safety and survival of a butterfly habitat which is home to the Large Blue species. With the bedding in of the military over a large area of countryside, the habitat becomes locked within an Exclusion Zone; into which it becomes foolhardy and extremely dangerous for unauthorised people to enter. However, this will not stop the local lad, with local knowledge and native skills, from trespassing and plotting to disrupt the occupation; in which cause he’s joined by Charlotte Kingsley, a pretty young lass, whose parents own a local pub in East Prawle. There are several other key and interesting characters who help shape the story, and none more so than a young coloured GI, Leroy Grant, whose arrival brings added and huge complications; some of which are not very difficult to anticipate! If you’d care to reflect on the hymn, ‘All Things Bright and Beautiful’, you’ll be well placed to consider the catalogue of emotions which travel through this narrative, including from dark to optimistic, spiritual to hellish, real to surreal, poignant to cruel; hilarious to tragic; until the story careers into the realms of believable insanity. Not withstanding all of this, you might still conclude to wonder, if the events you joined with, might just have happened; or actually did. This book is available to purchase from the publishers, Neaptide.